Lord Hayagreeva is the God of wisdom and knowledge. 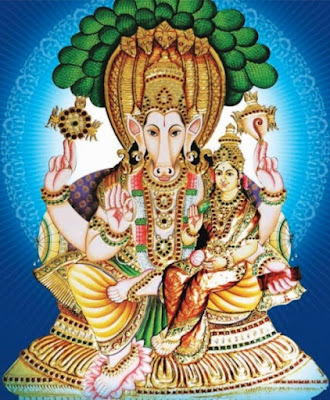 Hayagreeva Jayanthi falls on Aavani(tamil month) shravanam (star) / Shravan month . The oofering / naivedhyam is a sweet called "Hayagreeva"/"Maddi"/"Bandi". Offering this sweet to The Lord on any Tiruvonam day, gives knowledge and wisdom to the children and they will perform well in studies. Lord Hayagreeva, give us the power to discriminate between right and wrong. Choose red variety of jaggery ( paahu vellam) and crush it. Powder the cardamoms. Wash and pressure cook chenna dhal. When cool, drain the water and keep aside. Do not mash it. 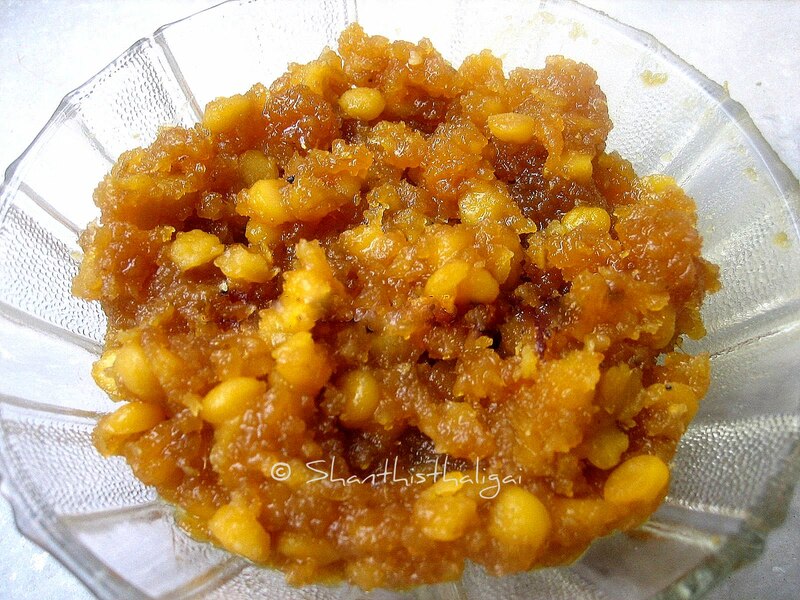 Dissolve jaggery in 1/4 cup of water and strain it without any mud. Heat a heavy bottomed pan, pour in the jaggery and allow it to boil till it diffuses its raw smell. Now add scraped coconut, cardamom powder and boiled chenna dhal and mix well . Add ghee and saute till thick. Offer it to The Lord. It is not nandi . It is a God with Horse face who rescued the Vedas from the asuras. As per Bhagavatham, there are some more avataras, one of which is Hamsa avatar and also Hayagreeva avatar. It is said that Vadirajar, will make the mentioned sweet and keep it in his head, and he can see a horse's feet from the backside on his shoulders and eat the sweet. Shanthi, I offer only honey because I was told about that in Thaadikombu temple. But next Thiruvonam onwards will bear this recipe in mind and offer.Thank you. Nice read as always shanti..and your prasada look yummy as well !! Nice informative post shanthi! Yummy dish too! I love this sweet dish..Mouthwatering!! Good post. My mil was just telling my daughter the other day to start saying the Hayagriva Strotram everyday while puja. the goras have hyped up our age old tradition into calling it Super Brain Yoga..what do you think of this. Thanks for the recipe. I dont have this in my book.Will add it.